I recently purchased the Yamaha MG10XU 10-Input Stereo Mixer mainly for use at home to do vocal music practice sessions with my daughter who typically accompanies me on the keyboard. 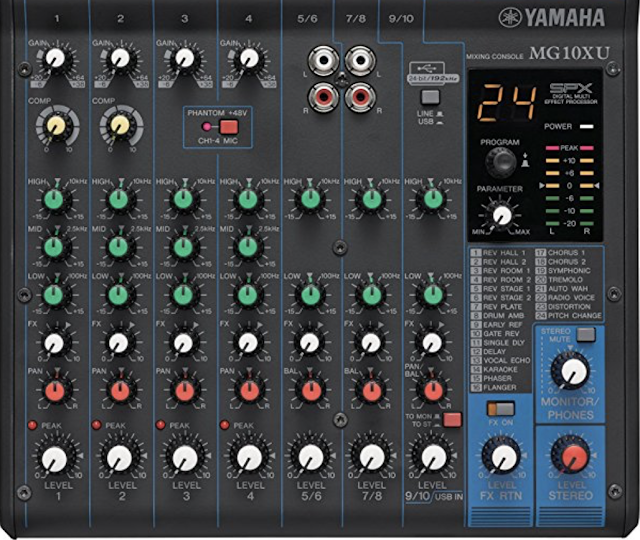 I must say, I am very pleased with the Yamaha MG10XU Mixer's ease of use and the quality of the effects processor providing a range of effects you can play with for your specific song situation. Different songs require different vocal ranges and feel and the appropriate sound effect is a required enhancement to make the experience truly come out for the listener. Since the time I purchased this unit, I have had several social gatherings at home with friends including Karaoke parties, impromptu singing sessions with visiting guests, and home chamber concerts with local talents. All of these gatherings were served well by the Yamaha MG10XU mixer unit. Input and Output sockets: 10 inputs comprising of 4 XLR+Line-in sockets and 6 line-in (L+R for stereo, individual for mono) sockets. One socket for connecting to a foot controller based effects handler. 2 line out sockets (L+R) and 2 XLR sockets for stereo out to loud speakers. 2 line-outs for monitor speakers and one for headphone monitoring. The Effects Processor can be enabled with a single push of a button. Effects cover a large range as you can see in this picture to the right. There are 24 effects in total and in my experience all of these work convincingly and seamlessly. The first two input channels have Compressor knobs to control how lively or punchy or mixed-in the sounds from those channels need to be on order to have better sound dynamics in the environment where the sounds are being played. One can also add 48 Volt Phantom power for the channels 1 - 4 mic XLR sockets, to maintain electrical charge for dynamic microphones. 48 V phantom power also has current limiting to prevent damage to the mics if the cable has any problems, such as a short. The built-in low, mid, and high equalization knobs for each channel (upto channel 4) and low and high knobs for remaining channels provides excellent range of controls for each channel enabling you to manage the mixing dynamically as a performance moves from song to song. There is also individual channel level control for effects through the FX knob. All in all this is a very good value for the home or small orchestral group setting such as a quarter or quintet and vocals. 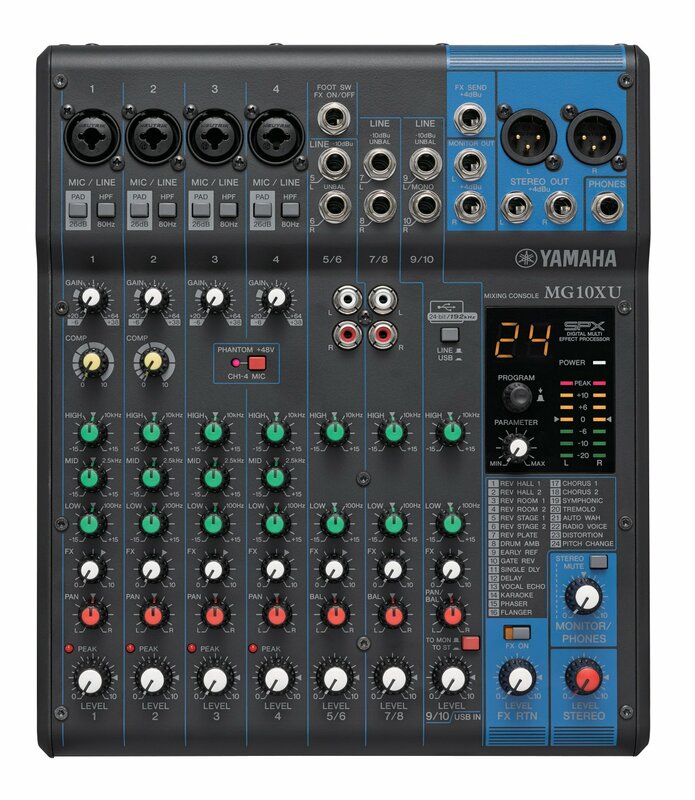 I highly recommend the Yamaha MG10XU 10-Input Stereo Mixer as a good mixer for that use case.